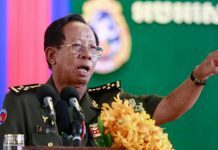 When Thai Princess Maha Chakri Sirindhorn arrives in Ratanakkiri province for the start of a three-day visit to Cambodia on Monday, she will enjoy the comfort and privacy of a luxurious freestanding bathroom built for her on the shore of a popular lake at a cost of more than $40,000, officials said on Friday. Construction of the 8-square-meter outhouse overlooking Yeak Lom Lake on the outskirts of Banlung City was carried out by the Siam Cement Group (SCG) at the request of the princess and took 19 days, according to Ven Churk, head of the Yeak Lom Lake committee. “This toilet was constructed for the Thai princess’ use. When the princess has finished with it, they will take the toilet equipment back to Thailand, but the princess will leave the building for our community to use,” Mr. Churk said. “They spent more than $40,000 to construct the bathroom,” he said, citing a figure provided to him by SCG workers, who finished construction on Friday. Tin Luong, the chief of Yeak Lom commune, said he had seen the outhouse and was impressed. “The materials are of the very highest quality,” agreed Suma Onkam, a Thai national who said he was hired by SCG to oversee the 10 Thai laborers who built the structure using only materials imported from Thailand. The facilities will almost certainly come in handy. “She is having lunch at the lake and we will be having a team preparing and sending the food for her,” he said. As for the bathroom, Mr. Clais said he knew little about it. 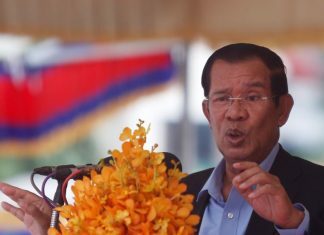 Deputy Ratanakkiri governor Nhem Sam Oeun said Cambodian laborers had also built a handful of more modest toilets for the rest of Princess Sirindhorn’s delegation—on top of “three or four” other public ones that already exist in the area. He said the princess’ lakeside sojourn was meant to be a relaxing first stop before her scheduled engagements over the following days. 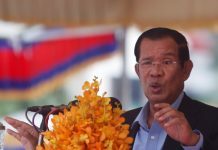 According to Cambodia’s Foreign Affairs Ministry, she is slated to help inaugurate a new health center in Ratanakkiri, preside over the groundbreaking of a new technology institute in Kompong Speu province and meet with King Norodom Sihamoni, among other events.